I am having a problem: When my units attack with [AAW weapons] it says “Firing unit most obtain from itself or another CEC-enabled platform a high-quality track on the target before firing”. What is the meaning of this? I never encountered this message before. So let us backtrack a bit and examine this in detail. – Units firing AAW ARH weapons (e.g. AMRAAM) must now actively detect the target on their own radar before being able to fire the weapon (ie. it is no longer enough to receive offboard contact from e.g. AWACS and fire based purely on that). This makes it much more challenging to employ AMRAAM-class weapons against stealthy targets or in a heavy-OECM environment. – After launching an AMRAAM-class weapon, the unit must still keep detecting the contact in order to provide mid-course guidance to the missile. If radar contact is lost for more than 5 seconds, the missile goes into a “blind” state and flies straight ahead (similar to SARH weapons who lose guidance). (Appropriate AI/EMCON logic has been added to encourage this). Now of course most players don’t read release notes (or manuals), but the importance of this change is hard to overstate. This is in some ways another important step towards more faithful modelling of the limits of side-wide command & control of operations, as well as cooperative engagements. In previous versions of Command (as well as all other similar titles), once a unit has a hard contact on a target, the contact information is immediately shared with all other units on the same side (unless they are off the comms grid) and is considered “fire control grade”: Based on this information, even units that have no sensor contact with that target can engage it with any suitable weapons, especially those have a lock-on after launch (LOAL) capability or terminal guidance. While this is usually “good enough” for a typical Harpoon/Exocet salvo or non-precision artillery fire, anti-air warfare (AAW) tracks have much higher precision & accuracy requirements, due to the speed and agility of the targets being engaged. 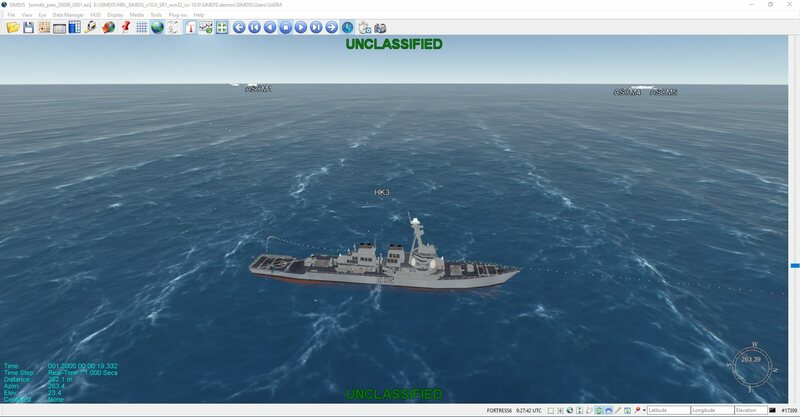 This created a sim realism flaw, and a game exploit: It was possible, for example, for fighters to use offboard tracks provided by EW/GCI radars or AWACS to fire weapons like AMRAAM at targets without having to detect them themselves (this allowed players to deal with stealthy opponents much more easily than they should). In reality this is a major aspect of cooperative-engagement capability (CEC), and is a feature that most air arms still lack. The B998.14 update fixed this problem: Offboard contacts are still disseminated but, in the case of air contacts, are by default considered as “not fire-control grade quality”. In fact, even on-board detections by non-FC sensors are insufficient: For example, a Su-27 detecting a target on its IRST can use that information to manouver against the target and maybe launch an infrared missile like the R-73/74, but it can no longer blind-fire an ARH weapon like the R-77 or PL-12: It must now first gain a solid onboard radar track on the target. 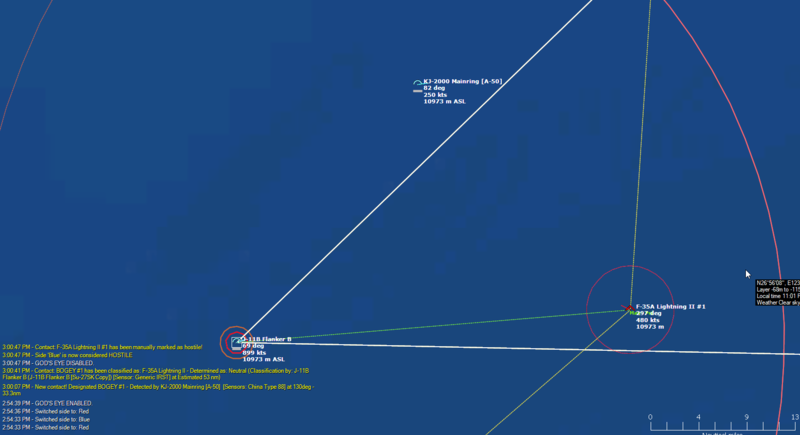 We see that, indeed, the target so far is detectable only by the AEW radar and the ISRT on the J-11B. This is why we cannot engage it yet. Obviously, this has significant ramifications for AAW engagements with modern ARH weapons. Stealthy aircraft, or assets covered with heavy ECM interference, are now particularly difficult to engage even with early warning (this, BTW, is one more reason that the SR-71 was notoriously difficult to engage – even when the missile geometry was right, its jammers were very effective). Fighters with ARH missiles and in a networked environment can remain EMCON-silent for the majority of their patrol, but to actually engage their assigned targets they have to emit even for a short duration – and for non-LPI sets this can be a dangerous tactical decision. This also highlights one more decisive benefit of CEC. In addition to enabling engagement geometries hitherto impossible and bypassing LOS blocks, CEC also removes the “mandatory onboard FC-quality track” as a requirement from the prefire checklist. First introduced in Swedish Viggens in the mid-90s as part of their AMRAAM upgrade, this capability has also been adopted by the JASDF’s AAM-4 missile and MBDA’s Meteor, while service-wide adoption of weapons like the SM-6 and AIM-120D is spreading this capability to the USAF/USN. This change is part of an ongoing series of improvements in CMANO’s air combat model; more changes are coming in future updates, which will introduce even greater fidelity and force players to rely even more on real-life tactics and procedures to succeed in the virtual arena. 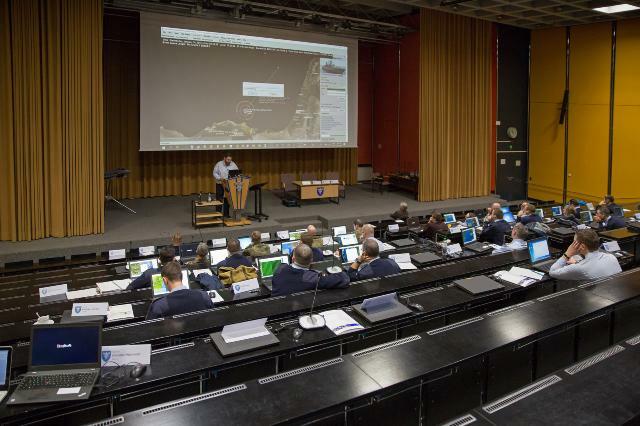 During the week of January 14 to 18, select members of WarfareSims and MatrixGames LLC presented Command PE at the Luftwaffe Officer School and trained officers of various branches of the German armed forces in its use and capabilities. It was a very successful event, and we would like to thank the entire staff of the academy, and especially Maj Silier, Lt Col Lochner, Lt Fleischmann and Lt Scholz for their coordination of the event and the above-and-beyond hospitality that they extended to us. Following is the English translation of the official description of the event, as presented on the Luftwaffe website (original here). Many factors determine the outcome of a battle: from the logistics and the deployment of the soldiers, to the morale of the troops or the supply of equipment. Ultimately, it is crucial to consider all factors and to deduce the right tactics from them. 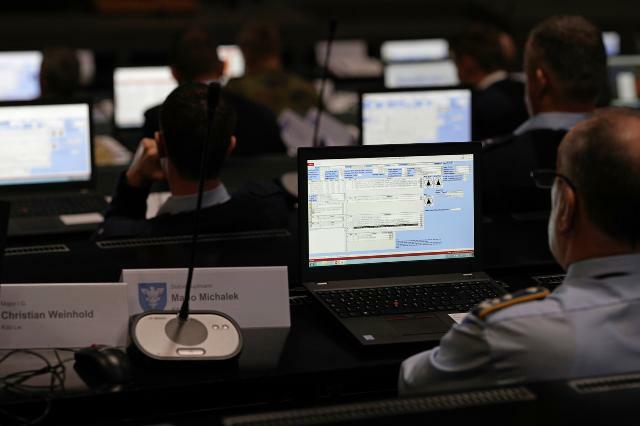 For this purpose, course participants at the Officer School of the Air Force use the simulation software “Command: Modern Air / Naval Operations”. 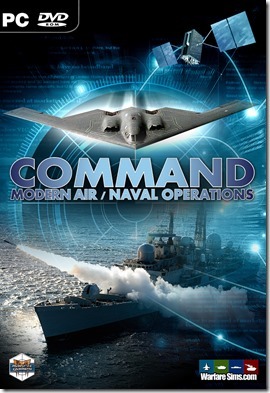 The program is used to represent air operations. The trainees get a fictional scenario by considering all the factors relevant to a battle and then having to plan their operations. “We then integrate the planning of the course participants into the software and see if their plan works,” explains Major Thomas Silier. 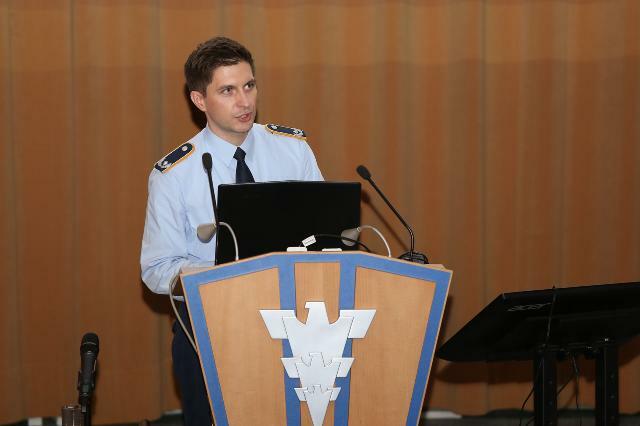 He is a specialist in air force doctrine & tactics, and also the project manager for the introduction of Command at the Officers School of the Air Force (OSLw). In fact, the software was originally designed not for the military but as a publicly available game. However, battles, and especially various air operations, are depicted so realistically that “the German and even the American armed forces have realized that Command has the potential to be used by them” explains Silier. For example, the software provides a comprehensive database of every aircraft from any armed forces back to 1946. The course participants are divided into different groups. All teams get different tasks that they have to plan for. For example, a group is responsible for protecting the airspace above the operational area. Another, in turn, is responsible for Close Air Support, which is the frontline aerial support of ground forces, ” says Silier. Then it’s about achieving common coordination. The fuel for the aircraft used must be determined, tankers must be on site in time and the respective operating times of the forces must be deduced. 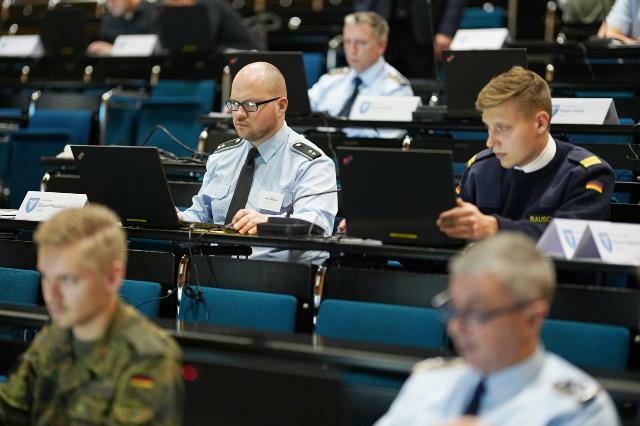 “I am very impressed by how complex the program is,” says Lieutenant Markus Kribelbauer. He used the program as a participant in the last officers’ class. In addition, he was fascinated by how much work Silier and his team have invested in addition. “From creating custom Excel spreadsheets to determine operating times to calculating the fuel consumption of the respective aircraft – I found that extremely impressive,” he says enthusiastically. Therefore, it is now being examined whether the software can also assist other areas of the Air Force. The program will be tested in a three-month trial period. Representatives of the various branches were recently briefed in Fürstenfeldbruck about the program. If Command makes a positive impression here as well, then the software could soon be used not only at the Luftwaffe Officer School, but in wider parts of the Air Force. * Syria 413, 2018: President Trump charged the Syrian government that it had used chemical weapons to attack the Syrian opposition and general citizens had suffered damage. He declared to strike Syrian major chemical facilities with the aid of the UK and France. * Air Battle – July 28, 2020: Chinese and Taiwanese air forces clash over the straits. * Albania Strikes Again, 1984: A sequel to the classic “Albania Airstrike”, this features Albania hitting back against the Italian Navy and Air Force, with new features like detailed aircraft damage and ports that were not present in the original. * Beyond Kashmir, 2019: Amidst a new crisis between India and Pakistan (and an intervening Iraq), a joint USAF/USN task force is assigned to neutralize Pakistan’s nuclear capability within 3 days. * Coiler’s Halloween Iceland Adventure, 2018: It’s Halloween, and the zombie sorceresses have decided to send an air force of rather spooky creatures (or rather, aircaft named after them) to strike Iceland. Are you a bad enough dude to hold back the zombie sorceresses? * Enough Is Enough, 2018: Russia has been steadily militarizing the Kuril islands against Japanese protests. New intelligence that elements of an S-400 system are to be deployed there was the last straw for the Japanese government. In direct violation of the its constitution, Japan will conduct its first offensive action since WWII. * Escape Port Haucurt, 2022: A bloody civil war exploded in Nigeria in year 2022 and radical muslims have taken control of several cities. Western citizens in the country were evacuated but some of them were stranded in the coast in a factory protected by contractors in Port Harcourt area, facing growing hostility. A tiny US Navy task force, focused on new LCS ships, fully equipped for littoral warfare, approached the coast to extract western citizens, knowing the rebels have very limited air support. LCS Montgomery ventured inside the huge Niger delta at night undetected and thanks to spec ops boats, Seahawk helicopters and a SEAL unit managed to extract all the people. The operation has been a great success, but at dawn rebel forces knew they have been cheated and throw at the Americans everything they have. * Hanukkah War, 2018: Iran has established a series of ballistic missile batteries aimed at Israel, protected by its newly-acquired S-300 SAM units. Israel’s armed forces have been tasked with promptly eliminating this imminent threat. * Into the Dark Nordkapp, 1985 (NATO + USSR versions): Realizing the Reagan military buildup was pushing the correlation of conventional forces away from their advantage and toward NATO, the Kremlin decided it was time to act. At Noon, Moscow time, on December 24th the word went out to all commands to execute “Operation Rhine” – the “Bolt Out of the Blue” attack from barracks, airfields and ports with no notice. The Soviet Union (& Warsaw Pact) would achieve strategic, operational and, for the most part, tactical surprise on all fronts with NATO caught massively out of position. * Mesa Verde meets ’em head-on, 2024: The Republic of the Congo has been involved in a border dispute with Gabon in the last few years, and some of its soldiers are accused of having committed war crimes. The United Nations has attempted to broker a cease-fire, but has been rebuffed. The US and its allies believe this represents sufficient justification for limited “show of force” strikes that it is hoped will finally bring the Republic of the Congo to the bargaining table. * New Mexico goes to war, 2023: Tensions between the United States and China have finally boiled over into actual hostilities. To the surprise of China, the American strategy was not to take the offensive in the South China Sea, but rather to make sure its allies could defend themselves. 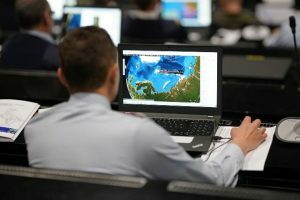 Meanwhile, the US moved to attack China on other fronts–cyber, space, and in the Indian Ocean. * Oil In Somalia – Italy vs India, 1990: Italian Somaliland was an Italian colony and in later years the Trust Territory of Somalia until 1960 when Somalia was granted independence. During this period Italians made up a significant proportion of the population. The civil war has escalated and the nation is in a state of chaos, the civil government close to complete collapse. Nine days ago the Indian air force dropped troops providing ‘humanitarian aid’ to the small port town of Eyl. It is clear the Indians are establishing a foothold attempting land grabs and expansion of an Indian-controlled Indian Ocean. The Italian marines of the San Marco regiment have been loaded onto the LPDs San Giorgio and San Marco and are tasked to land at Eyl and re-establish control of the airfield and expel the Indian troops. * Red Phoenix – Battle of the Tsushima, 1987: The 2nd Korean War is over. A Chinese airborne division sits in the no-mans-land between the 2 sides, making sure that the peace is kept. North Korea is finished. Not even the late intervention of the Soviet Union could have prevented its demise. However, that same Soviet intervention has sent shockwaves around the world. NATO and the USSR are closer to WW3 than they were during the Cuban Missile Crisis. In the North Pacific, a massive Soviet SAG prepares to cross through the Tsushima Strait. The only problem is that the survivors of the South Korean navy, as well as the American Constellation and Nimitz battlegroups, stand in their way. * Revenge in Beirut, 1983: On October 1983, a USMC barracks and a French paratroop headquarters were almost simultaneously bombed, with heavy casualties. Historically, France and the US took separate retaliatory actions with mixed results. This scenario assumes that both nations instead agreed on a joint reaction just before the 24th Marine Amphibious Unit (MAU) turn over on 17-19 November to both show resolve and create a safer environment for the relieving 22nd MAU. This attack would have three full (combined) carrier task forces in a battle group with the French carrier Foch also participating. * Senkaku Islands Clash, 2019: Tariffs and work economic disruption lead to increased tension and nationalism across the globe. With major problems in Chinese ports due to slowing trade, the PRC whips up nationalism over the Diaoyu (Senkaku) islands, leading to a Falklands-like amphibious assault in November 2019. Japan is not prepared to let that aggression stand and unlike the Falklands the U.S. (honoring their treaty obligations) will be a full belligerent. The World’s three largest economies are poised to square off over 7 square miles of island. * Southern Brawl (The War That Never Was), 1989: One day into World War 3, and Greece and Turkey are already beginning to crack under Soviet, Bulgarian, and Romanian pressure. The skies over Northern Greece and the Bosphorous Strait have been surrendered to Warsaw Pact air forces, who roam freely over the retreating Greek and Turkish armies. A new day brings new hope, but also dread at what the Warsaw Pact forces will do today. The Turkish and Greek air forces are given one job: Stall the Warsaw Pact air offensive, or die trying. * Sri Lanka Crisis, 2021: The recent election in Sri Lanka has been challenged by the losing party. The new government, already meeting strong opposition in the country, is expected to strengthen even further the commercial and military ties with the Chinese government. These include massive investment in Sri Lankan business and a new port at Hambantota, extensive sales to the army and the recent sale of a squadron of JF-17 Thunder fighters to the Sri Lankan Air Force. The Indians, asking for new elections are sending an amphibious task force to Colombo to stop the civil war, but the Chinese carrier task force Liaoning in the area is challenging them. A fierce fight between the Chinese and Indians formations with air support is expected in the next few hours. * The Gauntlet, 1989: With WW3 raging, NATO attempts to deliver two Amphibious Ready Groups centered on the USS Iwo Jima (LPH-2) and the HMS Ocean (L11) to Narvik and possibly bring the Warsaw Pact offensive in the North to a halt. Soviet forces will throw everything in their arsenals to stop this force from reaching Narvik. * The Seto Submarine Scare, 2018: In June 2016, the US put sanctions directly on China for “transfer of missile technology to North Korea, human rights abuses, aggression in the South China Sea, and sinister trade and diplomatic practices. Japan quickly followed, copying the US’s decision, adding sanctions for “mistreatment of Japanese POWs after WWII, promoting anti-Japanese sentiment, and espionage”. Anti-US and anti-Japanese protests broke out throughout China almost instantaneously as CCTV reported on the sanctions. Foreign Minister Wang Yi warned the US and Japan it would not tolerate aggression against the Chinese people, and would eagerly respond the the “information war declaration” that they had delivered. * Three CV’s exercises, 2017: The USN carriers Reagan, Roosevelt and Nimitz gathered around the Korean Peninsula to contain North Korea launching missiles. The North Korean government abruptly declared they would launch an ICBM toward the Continental United States. The US president decided to strike North Korean missile pads and nuclear facilities. Because the South Korean government expressed that it did not hope an all-out confrontation with North Korea, only the US forces would engage in the operations. * Turning the Tables, 1992: No US ground forces have come under air attack since the Korean war. This is now about to change. * Ulleungdo Island, 2018: A failed coup attempt on September 8th has resulted in civil war in North Korea and heavy, but confused, fighting is occurring across the country. On 10 September 2018, a US-Flag Ro/Ro ship was torpedoed and sunk by a rogue submarine. Your mission, as commander of the USS Campbell, is to sink that submarine before more commercial vessels can be sunk. One problem is you are alone, the ROK and Japan do not want to take action due to the sensitive situation in the North, and American naval assets in Japan have been evacuated due to a Category 5 Typhoon rapidly approaching the islands. * WWIII ’87 – Air Campaign Denmark, 10 July 1987: 10 July saw the beginning of a major effort by the Pact to secure air and sea supremacy in the Baltic. The focus of this effort was on Danish airbases. Of the fifty NATO airfields that were hosting combat aircraft in Central Europe, six were located in Denmark. The Royal Danish Air Force was a relatively small, well-equipped force with a respectable number of F-16 Fighting Falcons forming the core of its inventory. USAF F-16s were also anticipated to begin arriving in Denmark within the next forty eight hours to reinforce AIRBALTAP. When WP amphibious and airborne operations against the Danish homeland were inevitably launched, it was anticipated that they would be taking place in uncontested airspace. In order for that to happen, Danish airbases, radar sites, and air defenses had to be dealt a knockout blow before then. * Baltic Fury #1 – Storm The Gates, 1994: You are the commander of NATO’s BALTAP (Baltic Approaches) Command. BALTAP is a joint force of land, sea and air forces arrayed specifically to keep hostile WP forces bottled up in the Baltic Sea. Your forces are primarily Danish and German but some NATO reinforcements can be expected. The restricted waters in the western Baltic funnel hostile forces directly to the island of Zeeland and Copenhagen itself. One thing is certain, there will be a lot of combat power deployed into a very small space. * Caribbean Fury #2 – Retribution, 1994: You are tasked with continuing the reduction of Cuban/Soviet combat power while positioning for the next move – assisting a British and French force in stabilizing Belize while driving the three errant Central American governments out of the war (Caribbean Fury 3 – Rumble in the Jungle). In the midst of these sweeping objectives, the Commander of the new Special Forces Command wants to turn the situation to an advantage by gaining as much strategic intelligence as possible. * Indian Fury #4 – The Gate Of Tears, 1994: You are commanding the newly formed CTF 155 combining diverse forces to secure the island of Socotra and the Bab el Mandeb (BeM), the narrow gateway between the Red Sea and the Gulf of Aden know from ancient times as ‘The Gate of Tears’. Your forces will conduct several amphibious and airmobile operations while simultaneously fighting for control of the air and sea in this vital maritime choke point. * Indian Fury #5 – Hormuz Hoedown, 1994: You are commanding the newly formed CTF 154 centered on the USS Saratoga CVBG and combining all forces in the Persian Gulf region. Your primary task is to open the Straits of Hormuz to unrestricted navigation, but a critical and essential secondary task is to tie down Soviet and Soviet aligned forces (primarily Iran) so they cannot interfere in other theatres, particularly Syria and the Mediterranean. Finally, you must impress Saudi Arabia to commit to the conflict on our side, while preventing the spread of the war. The Indian Ocean is a secondary theater and cannot expect many reinforcements. Commander 5th Fleet will deploy to Socotra Island once it is clear, from there he will fight the larger battles in the Pentagon, but right now more forces and supplies are leaving the area then are arriving. * A New World, 2005: In 1988, the Cold War turned nuclear. Out of the ashes, many countries emerged as new powers in the world, including Australia, New Zealand, Nationalist China, Argentina, and Brazil. These powers gradually combined to form 2 superpowers, the Pacific Coalition (Australia, New Zealand, China, and the remains of Japan and Korea) and the Latin Confederacy (All of Latin America, mainly occupied by Argentina and Brazil). 17 years later, what remains of the US is finally getting back on its feet. Constantly being probed on its southern border by the Latin Confederation, they turn to the more western-oriented Pacific Coalition for help. The Pacific Coalition responds by dispatching a large naval group of 2 Ex-US carriers, the floating helibase that was once HMAS Melbourne, and escorts formed from every nation in the coalition. As this naval group moves towards the rebuilt Naval Station San Diego, the Latin Confederacy moves to intervene. * Operation Sapphire Fury, 2019: The United States had in the past stated that the growing occupation and militarization of islands in and around the South China Sea was unacceptable. Publicly stated American policy towards the SCS littoral area was framed in the strongest words, but privately US leadership had made the decision for years to ignore what was happening in the region. Several weeks ago however, after lengthy consultation between the Joint Chiefs and POTUS, Admiral Rolland Marshall commanding officer of USINDOPACOM received standing orders to roll back the illegal occupation of the Philippine island province of Palawan. 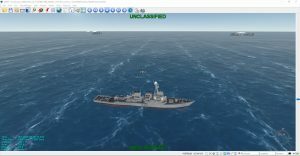 As always, the community scenario pack is available for download from the Command downloads page: http://www.warfaresims.com/?page_id=1876 . The complete pack will also become subsequently available for download on the Command workshop on Steam. ATHENS, GREECE – WarfareSims Professional Services and MatrixGames LLC are pleased to announce the official release of Command PE v1.14, the new major update to Command Professional Edition. DIS support enables Command PE to interoperate with other systems in a common real-time simulation environment, using the Distributed Interactive Simulation standard. Less visible, but equally important, is the remote-entity framework developed for interfacing DIS with the existing Command environment: This can be re-used and extended in the future for other connectors like HLA, CIGI, AIS, ADS-B etc. Configurable Mechanics Overrides allows much more flexible overrides without the need for customer-exclusive builds. It also offers a number of publicly-available overrides (in addition to the private customer-specific ones) and makes it significantly easier to implement additional overrides in future releases. End-users can thus more rapidly add their own extensions to the simulation (classified models, abstractions, more elaborate mechanics etc.) and implement new ways to interoperate with their existing infrastructure. The ability to export to SIMDIS offers a new rich 3D visualization option, using a platform already in high usage across US and NATO operators. Combined with the existing support for Tacview (both file-based and real-time streaming) and future support for the CIGI protocol, Command PE’s options for external visualization and analysis are rapidly expanding. 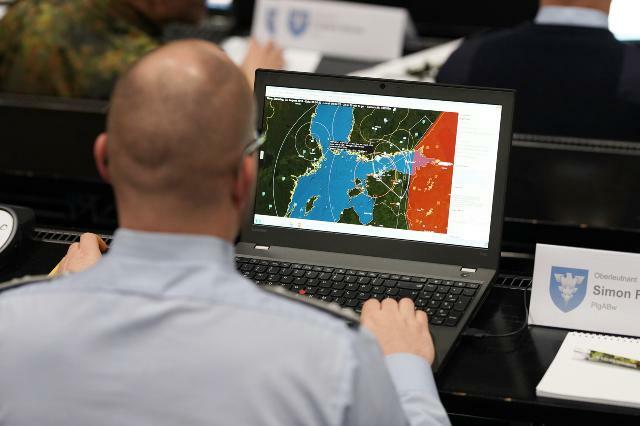 The new Line-of-Sight (LOS) Tool makes it easier than ever to estimate and visualize the actual LOS coverage of an arbitrary platform anywhere in Command’s virtual environment. Future upgrades to the system may include the ability to combine the LOS-visible areas of multiple platforms, such as when analyzing the coverage of an IADS network. A new event type, “Docking Operations”, allows exporting and subsequently analyzing elements of non-aircraft operations such as boat deployment rates, frequency of port revisits etc. In addition, the new v475 database update features the latest changes and additions from military hardware worldwide, including available open-source data on the latest US, Russian and Chinese hypersonic & UAV/UCAV development projects. Development of Command PE continues further, driven by the needs and priorities of its rapidly expanding and diverse user base across the US and NATO allies.